Nelkin Designs Blog: Deathflake for my Girl! I finally finished and gave my girl her "Deathflake" Hat last night at our annual family celebration. It was so freshly off the needles that I didn't have time to block it before I gave it to her, and now she won't take it off, so it's not going to get blocked for quite some time! I found out about the chart when Stephanie tweeted about it earlier this fall and knew right away that it was destined for holiday knitting. Then when studying one of my co-workers Christmas Sotckings I was smitten by her Latvian braid details and I decided that had to be part of it as well. That is one fantastic hat. Love it...I want one, my kids want them...gotta work on my skills. 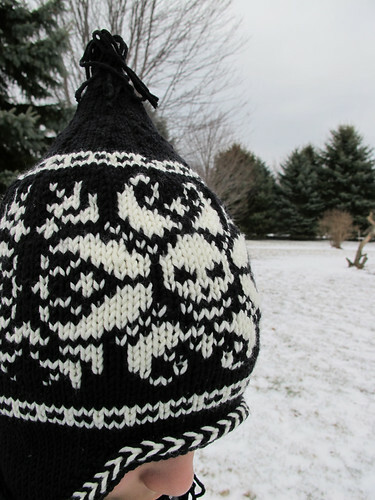 if only i'd seen this before the holidays - my sister would love this hat! glad to see yours was well received!